Naturally, bookish Prue is skeptical of Erik's true intentions in regards to winning her over. Of all the women in the world, why could he possibly want her? Since Erik is used to getting anything he wants, he is surprised upon learning that Prue is immune to his Voice. Prue's immunity to Erik's ability results in the most powerful and sizzling flirtation, especially since Erik realizes he has to rely on his true personality to secure Prue's affections - sans the "Magick." For you True Blood fans out there, you'll most likely enjoy the chemistry and romance between Prue and Erik because it's very similar to Sookie and Bill's chemistry (since Bill can't "glamour" Sookie and has to rely strictly on his personality to charm her). Not only is this romance novel super-steamy, but the supernatural elements in this plot are very fun and original. Thief of Light is a true hybrid of fantasy and romance, so if you love both genres, you're definitely gonna enjoy your time with this novel. The love scenes in Thief of Light are few and far between, however, an appropriate amount of focus is placed on the relationship between Erik and Prue, making it easy to relate to their situation. The romance isn't too fluffed up, so even contemporary romance fans will enjoy their time with Thief of Light. The first novel in Rossetti's Four-Sided Pentacle series is The Flame and the Shadow. The third and fourth novels in the series that follow Thief of Light are The Lone Warrior and The Dark Rose, respectively. 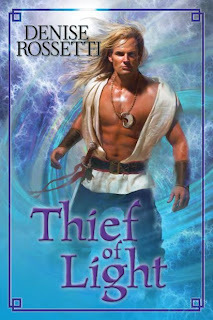 Also, if you enjoy Charlaine Harris' Sookie Stackhouse series (True Blood), you'll like Thief of Light. What are your favorite paranormal romance novels? Who are your favorite romance authors? Share your thoughts with us in the comments section below!